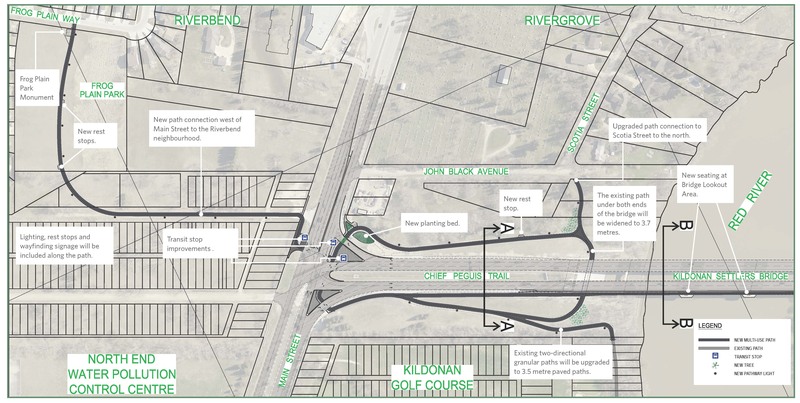 This project will close a gap in the pedestrian and cycling pathway network and improve access to Transit services by extending the Chief Peguis Greenway west from Henderson Highway to Main Street and to the Rivergrove neighbourhood. Funding is supported by the Government of Canada through the Public Transit Infrastructure Fund. Construction began in spring 2018 and will resume in early 2019. Project features include new multi-use pathways, a widened pedestrian and cycling path on the south side of the Kildonan Settlers Bridge, and improvements to existing transit stops, lighting, signage, and landscaping within the project area as well as improved traffic operations at the Main Street and Chief Peguis Trail intersection. View more information and the chosen design. Thank you to everyone who participated in the public engagement process to develop a recommended design for the Chief Peguis Greenway Extension. An open house was held January 31, 2017 at the Red River Community Centre, 293 Murray Avenue. The exit survey was available at the open house and an online survey was available from January 18, 2017 to February 15, 2017. The online survey was closed on February 15, 2017. After processing and analyzing the feedback received, the public engagement summary is now available. Provided our designers with local input and knowledge of the area. Informed the Project Team of concerns with existing conditions. Identified preferred routes for pedestrian and cyclists (i.e. desired lines). Provided input on issues such as connectivity, safety, access, or conflicts. Identified areas requiring improvements (i.e. lighting, transit, signage, etc.). In 2015, City Council approved the Winnipeg Pedestrian and Cycling Strategies document, which provides a long-range policy framework for active modes of transportation for the next 20 years. The Strategies document identifies a connection from Henderson Highway to Main Street as a high priority project. 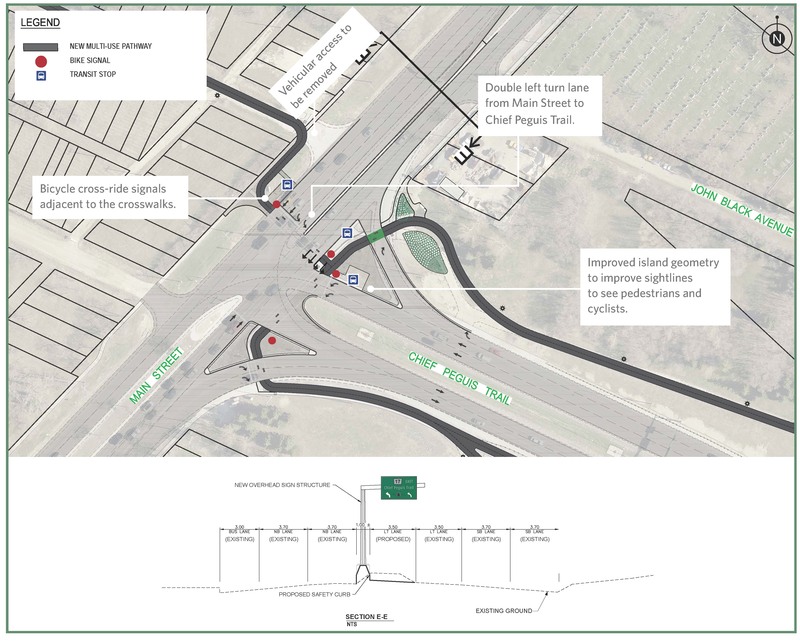 In the spring of 2016, Winnipeg City Council approved funding for the preliminary design of a Henderson Highway to Main Street connection as part of the 2016 Pedestrian and Cycling Action Plan. Design work and public engagement was undertaken in 2016 and 2017. Funding for this project was approved in the 2018 City budget with support from the Government of Canada Public Transit Infrastructure Fund. A number of constraints and opportunities are present in the study area which will influence the location of the pedestrian and cycling facility. The naturalized grassland area east of the Red River and north of Chief Peguis Trail should not be disturbed. An existing culvert crossing over a creek east of the Red River and north of Chief Peguis Trail will influence the location of the pedestrian and cycling facility crossing. The pedestrian and cycling facility will need to connect to existing transit stops. The pedestrian and cycling facility should avoid crossing private property. The design needs to consider riverbank stability and risk of flooding. The sidewalk on the Kildonan Settlers Bridge cannot easily accommodate widening. The design needs to consider the classification and speed of roads in the project area. There is a sound wall adjacent to the south side of Chief Peguis Trail, east of the Red River extending from the Kildonan Settlers Bridge to Henderson Highway, which will influence the location of the pedestrian and cycling facility. The vegetation along the riverbank is considered invasive. Removing it to accommodate a pedestrian and cycling facility is acceptable and creates an opportunity to have a pathway in a park-like setting. 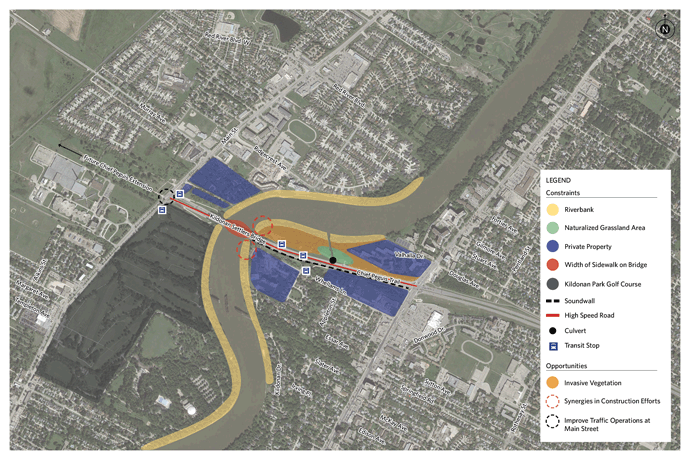 Upcoming City of Winnipeg Water and Waste projects on the north and south side of Chief Peguis Trail, east of Kildonan Settlers Bridge, can create synergies in construction efforts (i.e. clearing and grading work). There is an opportunity to improve traffic operations at the Main Street and Chief Peguis Trail intersection. What is the purpose of the Chief Peguis Greenway Extension Project? 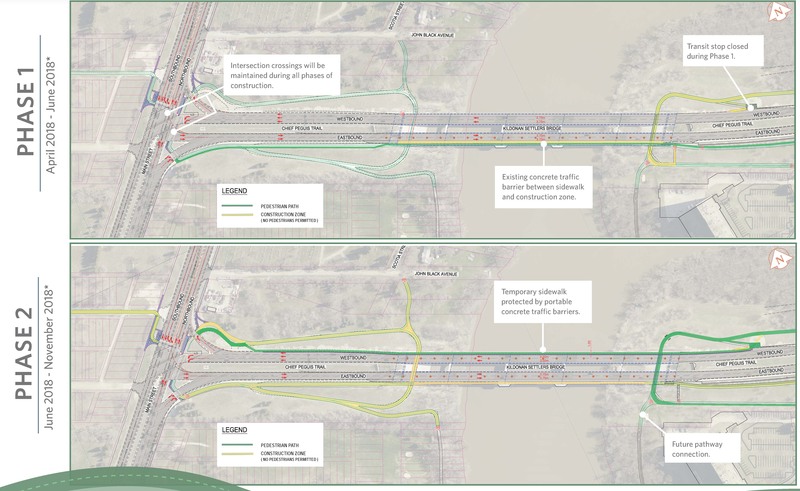 The City of Winnipeg Pedestrian and Cycling Strategies identify an off-street multi-use pathway connecting Henderson Highway to Main Street as a moderate to high priority project to create a continuous east-west active transportation corridor along Chief Peguis Trail. This project will upgrade the existing pedestrian and cycling facilities to better accommodate multiple user groups, including cyclists, pedestrians, and improved access to Transit. Construction of asphalt & concrete multi-use pathways along the existing roadway embankment of Chief Peguis Trail from Henderson Highway to Main Street and through Frog Plain Park from Main Street to Frog Plain Way. Widening of existing sidewalk on the south side of the Kildonan Settlers Bridge to accommodate pedestrians and cyclists. Improvements to the Chief Peguis Greenway Pathway and Main Street intersection including an additional left turn lane on Main Street and the installation of bicycle crossing signals. Landscaping and corridor amenities including new trees and plantings, seating areas and wayfinding signage. New pathway light installation along the entire pathway as well as beneath both ends of the bridge. View more information and the chosen design. Will traffic and/or pedestrian and cyclist access be impacted during construction? Pedestrian access between Henderson Highway and Main Street will be maintained. During a portion of the construction period, pedestrian access between both ends of Kildonan Settlers Bridge will be temporarily moved to the north side of the bridge on a temporary sidewalk protected by portable concrete traffic barriers. Temporary closures of existing pathways will be required as the new pathway will be constructed along existing alignment. Pedestrian access below Kildonan Settlers Bridge will be closed temporarily. Transit stops at Main Street and Henderson Highway will be maintained at all times. Both eastbound and westbound transit stops east of Kildonan Settlers Bridge will be closed temporarily between April 2018 and June 2018 due to pathway construction. During this time, affected passengers from the apartment complexes at the end of Whellams Lane will be directed to catch the Routes 85 or 90 on Whellams Lane and ride to Henderson Highway. Passengers can then transfer at Henderson & Whellams Lane to the Route 77 service. There will be intermittent curb lane closures on eastbound Chief Peguis Trail during non-peak traffic hours during sidewalk widening on Kildonan Settlers Bridge between April 2018 and November 2018. There will be intermittent lane closures at the Chief Peguis Trail and Main Street intersection for approximately two months to accommodate intersection improvements. A minimum of two lanes of traffic in all directions will be maintained during both morning peak hours (7 a.m. – 9 a.m.) and afternoon peak traffic hours (3:30 p.m. –5:30 p.m.). Pedestrian access at the intersection Main Street and Chief Peguis Trail will be maintained at all times. Schedules are subject to change during construction. The budget for this project is estimated at $7.2 million, cost shared between the City and the Government of Canada. How will the Chief Peguis Greenway Extension affect the Chief Peguis Trail Extension West? The design for the Chief Peguis Trail Extension West is in progress and it is not yet known when the trail extension will be built. 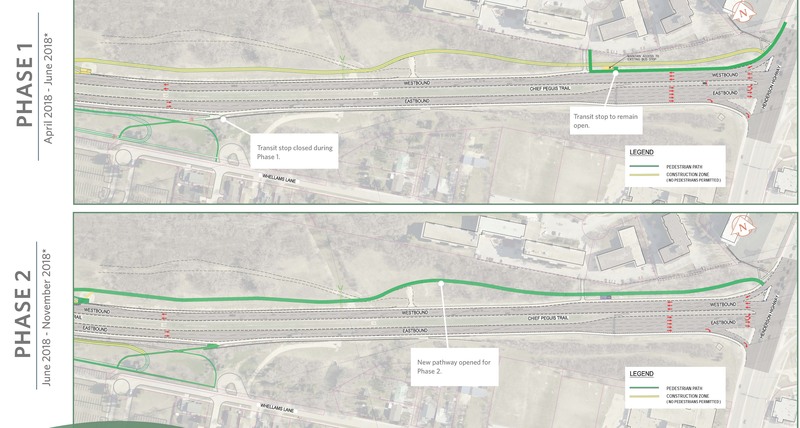 Those working on the Chief Peguis Trail Extension West Project are aware of this Greenway Project and design to eliminate the pedestrian and cycling gap from Henderson Highway to Main Street. The design of the Greenway will be taken into consideration in the Chief Peguis Trail Extension West project. View more information for Chief Peguis Trail Extension West. Are there other projects in the area with construction during same timeline? Installation of access roads and work areas. Installation of micro-tunnel boring machine launch and receiving shafts on either side of the Red River. Installation of approximately 250 meter long river crossing utilizing micro-tunneling trenchless installation methods under the Red River. Conversion of launch and receiving shafts into concrete chambers including internal piping, ladders, lighting and other features. Connections to the existing 1200 mm diameter trunk sewer. Additional information for this City of Winnipeg Water and Waste project will be relayed through construction notices. On July 15, 2015, City Council adopted the Winnipeg Pedestrian and Cycling Strategies. This document stems from the 2011 Transportation Master Plan. The Strategies provide a long-range policy framework for active modes of transportation in Winnipeg for the next 20 years. Following public engagement with more than 3,000 Winnipeggers in 2013, the Strategies will assist in the prioritization of walking and cycling infrastructure projects city-wide based on further in-depth engagement with neighbourhood and local stakeholders on a per project basis.